NHS nurses have warned they will take industrial action if UK Prime Minister David Cameron attempts to cut wages to fulfill his promise of a “seven-day NHS,” the Royal College of Nursing (RCN) has said. The RCN’s caution follows a similar warning by Britain’s biggest health union, UNISON, who said they would ballot members for strike action if the government cut unsocial hours payments. Cameron renewed his pledge to create a “seven-day” health service in his first major post-election speech on Monday. The PM promised to increase the NHS budget by at least £8 billion a year by 2020 and to recruit 5,000 new GPs. Speaking at a GP clinic in the West Midlands, Cameron said: “Our commitment is to free healthcare for everyone - wherever you are and whenever you need it. UNISON’s head of health, Christina McAnea, greeted the government’s promises with caution. “We welcome Jeremy Hunt's recognition that a seven-day NHS will cost money, and look forward to talking to him about how the proposals can be introduced,” she said in a statement on Monday. 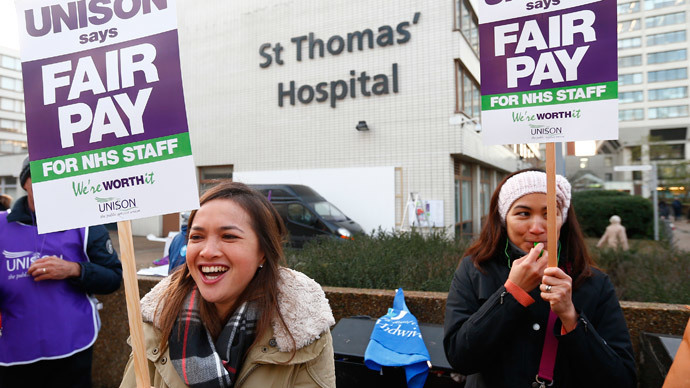 UNISON said last month it was prepared to hold a vote amongst its members if the government attempted to cut wages to achieve a seven-day NHS. The union represents hundreds of thousands of nurses, paramedics, therapists, porters and other healthcare professions. #torycuts 7 day healthcare with no funding, longer waiting times and an NHS on its knees with nurses ready to strike. Tory make believe. Some 400,000 NHS workers went on strike for the first time in 32 years last October over a pay dispute. The industrial action was called after Health Secretary Jeremy Hunt refused to increase wages by one percent, as the NHS pay review body had recommended. Hunt averted further strike action in the autumn by offering staff earning up to £56,500 a one-percent pay rise. RCN refused to join last year’s industrial action, defending its non-involvement as the “ethically responsible” thing to do. The union has never gone on strike, making its warning of future industrial action all the more ominous. “I would particularly give a really strong warning to the secretary of state: any attacks on unsocial hours, weekend working payments, would be strongly resisted,” said Peter Carter, RCN’s head, as cited by the Independent. The National Health Action Party (NHA Party) – a political group which campaigns for a better-funded NHS – criticized Cameron’s speech for lacking detail in a series of tweets. “It’s useless Cameron talking up 24/7 NHS without pledging more money, more staff and address the social care crisis. GET REAL,” the group said in a tweet. “Cameron said he wants a ‘properly funded’ NHS. So how about he just properly funds it to keep pace with our increasing + ageing population?” they added. Concerns over the future funding of the health service come amid allegations that private healthcare firms get unfair tax breaks, which enable them to outbid the NHS when competing for contracts. “What we are seeing here is that VAT is used as support for private companies without any consideration of what it is doing to the NHS,” Green Party candidate Michael Gold said.